Your group can explore ancient Irish churches that echo the land of saints and scholars. Visit many of the numerous pilgrimage sites throughout the island of Ireland. Enjoy outdoor activities - spend time on a farm, climb Croagh Patrick - Ireland's holy mountain, walk ancient pilgrimage routes and learn how to play the Irish game of hurling. Meet and share experiences with local Irish Youth Groups. Participate in an archaeological dig or help with a local community initiative. Learn a traditional Irish Ceili Dance, to play the bodhran, to speak a few words of Gaelic. Learn about the Peacemaking process in Northern Ireland, Ancient Irish Traditions, Celtic Spirituality or the 1916 rising. Standing 214m at their highest point the Cliffs of Moher are a site which cant be missed. 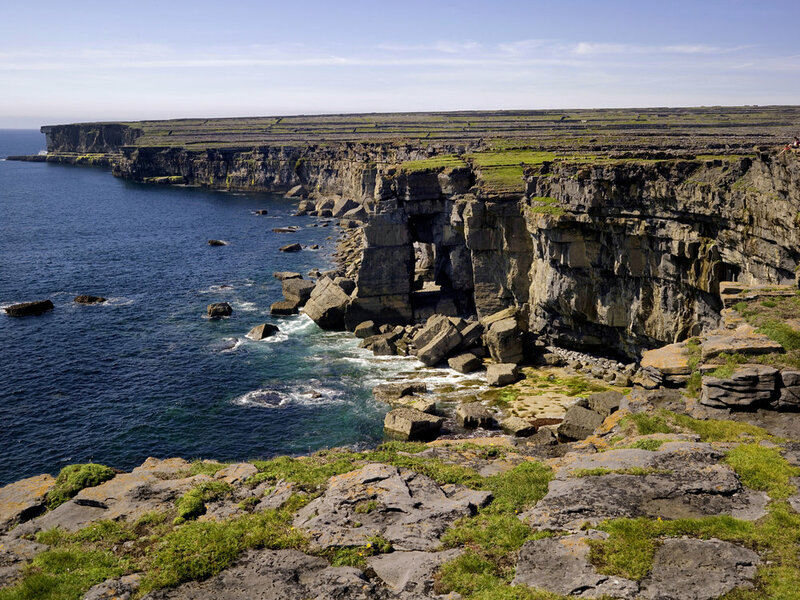 The cliff face stretches for 8 kilometres along the Atlantic coast of County Clare in the west of Ireland. The natural, rugged and panaromic view that awaits visitors has been host to many film and music video crews staring in famous hollywood movies such as Harry Potter and the Half-Blood Prince. Everything you dreamed that Ireland would be – and more. In Ireland our Gaelic Games is part of who we are and what we do. Learn the ancient art of our stick and ball game “Hurling” – the oldest, yet fastest field sport in the world. Play and learn about the most popular sport in Ireland, Gaelic Football. Take an alley, 4 walls, 1 ball, 4 or 2 players, fast and furious pace and this is “Handball”, another of our Irish sports. Fun, fast, yet accessible to all. Learn about Irish culture at its best and by having a Cltic Night during your stay. See World Championship Irish dancers and All-Ireland winning musicians showcasing some of Ireland’s ‘sean nos’ (old style) Irish dance & the famous Brush Dance. Sure to Get everybody joining in its the perfect evening for any group. This visitor attraction opened in 2012, it is a monument to Belfast's maritime heritage on the site of the former Harland & Wolff shipyard in the city's Titanic Quarter where the RMS Titanic was built. At Titanic Belfast, visitors can view Dr Ballard's high definition footage of what Titanic looks like today and can learn more about individual items in the wreckage using the interactive pods. Looking to Book your Youth Tour ? Fill in the below form and let Celtic Footstep help. Interested in finding out more about the many cultural and Heritge site you could visit in Galway ? Contact us today to start your group adventure in Ireland.